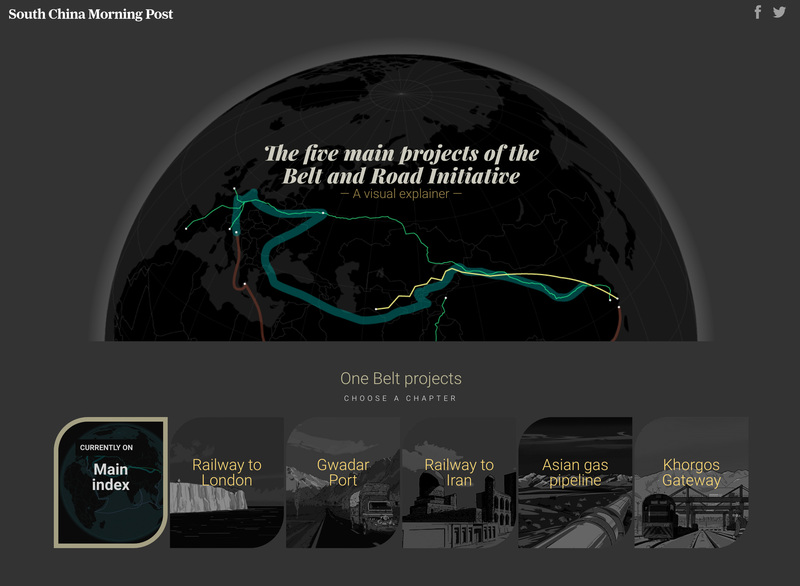 HONG KONG and NEW YORK, 11 October 2017 – “Belt and Road Initiative”, a visual explainer created by the South China Morning Post, was named the Best Data Visualisation Project at the World Digital Media Awards, announced yesterday at the IFRA World Publishing Expo in Berlin. This top honour is a valuable addition to the array of over 500 accolades that the SCMP has won in the past five years. Organised by the World Association of Newspapers and News Publishers (WAN-IFRA), the SCMP project bested all contenders from North America, Latin America, Europe, Africa, Asia, the Middle East and India for the top prize. The World Digital Media Awards recognise news publishers around the globe for groundbreaking digital products that engage readers and contribute to online growth. “Belt and Road Initiative” introduces readers to five ambitious projects, namely the direct rail link between China to the United Kingdom, the China-Pakistan Economic Corridor, the freight train from China to Tehran, the Central Asia–China Gas Pipeline and the Khorgos Gateway connecting Kazakhstan to China by rail. Please click here to access the package. On top of the recent Best Data Visualisation honour, the SCMP has amassed over 500 accolades since 2013, including regional and international awards such as the International News Media Association (INMA) Global Media Awards, the Malofiej International Infographics Awards, Society for News Design (SND) Awards, PANPA Newspaper of the Year Awards and the Society of Publishers in Asia (SOPA) Awards, among others.